Send greetings for any occasion with our gaily colored bouquet. 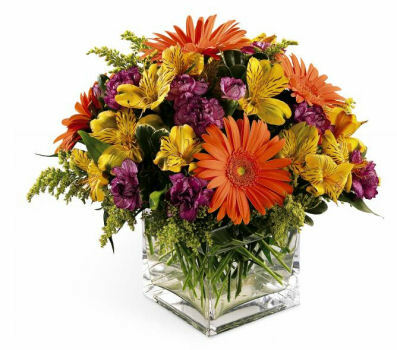 Bright orange Gerbera daisies and purple mini carnations are only slightly subdued by golden alstroemeria and solidago. Arranged in a clear glass cube, each flower delivers a warm and wonderful wish.